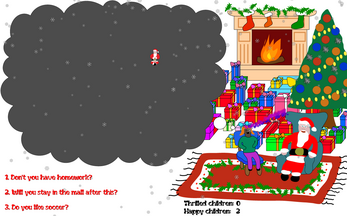 Mind reading Santa is giving away gifts. Help him read the minds of the children to figure out what they want. 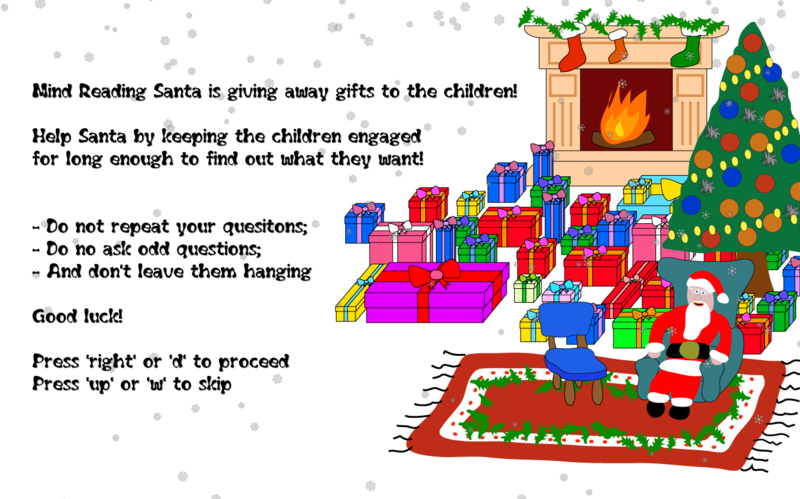 Children will sit by Santa for a chat - indulge in a long enough conversation to go up through their mind until you find what they are after. Leaving them hanging will shorten their attention span. Asking the same questions over and over again will make them impatient and asking odd or offensive questions will make them angry. 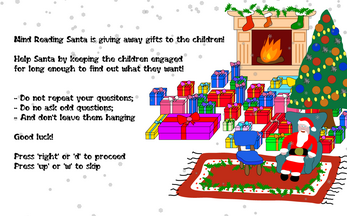 All children get a gift, but those that get exactly what they wanted will be extra thrilled. Controls - arrows or wasd to move and jump, and 1-2-3 to select the next question (numpad OK). 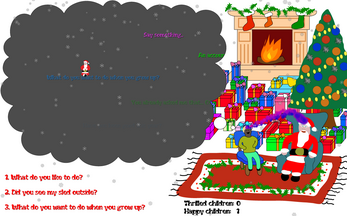 Santa's questions are in blue, replies are in green and silent thoughts are in magenta. Game is experimental, due to time constraints for the Game Jam submission. Also, game was not properly beta-tested. Please report bugs if you find any. Enjoy, and spread the holiday spirit!